Because the term “worship leader” means so many different things to so many people, it is always best to see what Scripture has to say about the role of worship and those who lead corporate worship. True worship, whether corporate or individual, has several major components, as described in Romans 12:1-2. First, the motivation to worship is “the mercies of God” which embodies all He has given us, none of which we deserve. Second, the manner of worship is the presentation of our bodies, including our hearts, minds, hands, thoughts, and attitudes to God. Third, our worship involves renewing our minds through the Word of God. To know the truth, to believe the truth, to hold convictions about the truth, and to love the truth will naturally result in true spiritual worship. Fourth, true worship is God-centered, not man-centered. The purpose of worship is not to produce an emotional experience, but to acknowledge God’s singular worthiness to be worshipped. So the first duty and responsibility of those who desire to lead others in worship must be to first understand the nature of worship itself. Although the New Testament does not name “worship leader” as one of Christ’s gifts for the edification of the church (Ephesians 4:11-12), worship leaders are common in the modern church. If the worship leader is to lead, he must lead by example, and his life, therefore, must exemplify that of the true worshipper. As with all leaders in the body of Christ, his must be first spiritual leadership. He must be the first to bow before God in humility and obedience. Just as the high priest had to sacrifice for his own sins first, so must the worship leader ensure he has scraped away the hardness from his heart and loosened the stiffness of his neck before he can begin to lead others. It is the primary duty of a worship leader, therefore, to be aligned with God’s will and to be humble before the great and awesome God. He must lead in humility and genuine concern for those under his care. 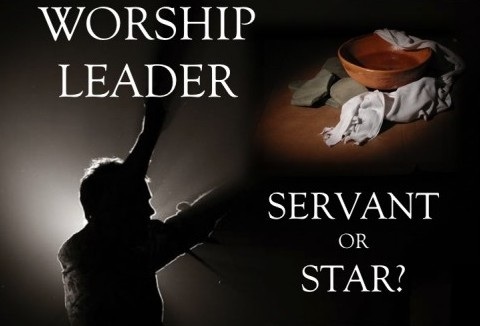 Because worship leader is not a biblical office for the church, his role is somewhat indistinct. Most worship leaders are musicians of some kind, whether vocal or instrumental, and their primary role is to lead the other musicians/singers that are involved in the service. It is the responsibility of the worship leader to ensure that it is not the music, nor the instruments, nor the presentation, nor the voices which are the focus of the worship service. Worship is bowing humbly before God and exalting Jesus Christ as King of kings and Lord of lords. The responsibility of the worship leader is to become less, that Jesus Christ can become more. And when all of this is done, when hearts are humble before Him, His people are ready to receive, and be changed by, the focal point of the worship service—His glorious and living Word. There is simply, in my opinion, no excuse for being chronically late. Lateness happens occasionally to all of us, but chronic lateness is a sign that something is out of order in someone’s life-either pride, organization, priorities, over-commitment…something. Whatever the reason, it does not honor God to hold everyone else up on a regular basis. If you struggle with this, make it a top priority to deal with it. There are no catchall rules for dealing with people. The way you deal with one singer on your team may not work for another singer. Get to know your team members individually-what makes them tick, what they love, the dynamics their families and jobs bring to the equation. Give extra time and grace to those who need it. Your expectations and methods should be flexible enough to allow many types of personalities to coexist in your ministry. Guitar horribly out of tune? Stop. Did the drummer start playing in 3/4 instead of 4/4? Stop. Are the singers singing a different song than the band is playing? Stop. Too often, our performance mentality dictates that we’re supposed to pretend that nothing is going wrong so the audience won’t notice. They notice. Just stop and fix it. I don’t have perfect pitch, so one time when my keyboard accidentally got transposed, I didn’t realize right away. Until the singer started to sing and couldn’t reach the notes. I should have stopped and fixed it, but my inexperience told me to keep going and pretend nothing was wrong. I think that singer has just now almost recovered from his head explosion. Just because the latest and greatest worship song is a rocker doesn’t mean your congregation can no longer worship God with a favorite hymn. It is our human economy that lets us believe God cares at all about trends-He doesn’t. He’s already heard the latest fad long before it came out. And besides, fads are based on generalities that are often easily disproved. For example, modern worship, which is arguably most heavily influenced by U2’s music, tends to be marketed towards the 18-30 crowd. But U2 came out in the early 80s, which means their music is just as relevant to people in their 40s and 50s. Age, styles, tempos, volumes, instruments-it’s all up for grabs. Don’t get pigeonholed by trends. Authenticity beats hipness any day. Creative people tend to be bad administrators, and administrators aren’t always the best songwriters. Your methods of working (both how you work and what you expect from your team members) need to be based on these strengths and weaknesses. If you’re creative, get administrative help rather than let your team suffer under your bad organizational skills. Devotionals times, while valuable for team building, can be misused. Team devotionals should either be related to the task at hand (worship, music, fellowship) or be related to the current teaching series of the pastor. They should not be used as your personal opportunity to preach or show off your biblical wisdom. Remember, many church members hear a message on Sunday mornings, a different message or two on the radio during the week, a Bible study in their small groups, a different study in their personal time, and then your weekly devotional. How are they expected to retain all these different messages? They can’t. Make this time count. (A) Rehearsal time is for rehearsing. When people give up their weeknight to come rehearse, it is important that you don’t monopolize their time with stories about your kids. And you should always strive to be the most prepared person in the room. There is a big difference between rehearsing and practicing. Practice at home, then rehearse what you practiced with the team. (B) Fellowship time is about fellowship. Using social time to discuss “work” can be annoying. Use that time to just get to know about your people. Have fun-it’s not a meeting. (C) Worship times are for worship. Once the service starts, allow that things will go wrong. At this point, you either believe it is in God’s hands or not. You stay focused on God. If you focus on the problems, so, too, will your congregation. This sounds easier than it often is for people in ministry. I constantly struggle with getting so busy doing “God’s work” that I forget to check in with God in my own life. Daily time with God is the most valuable thing we can do, and how often do we simply see it crowded out of our schedule? If you get one thing from this list, I hope it’s this one. For me, too.